Hello Friends! 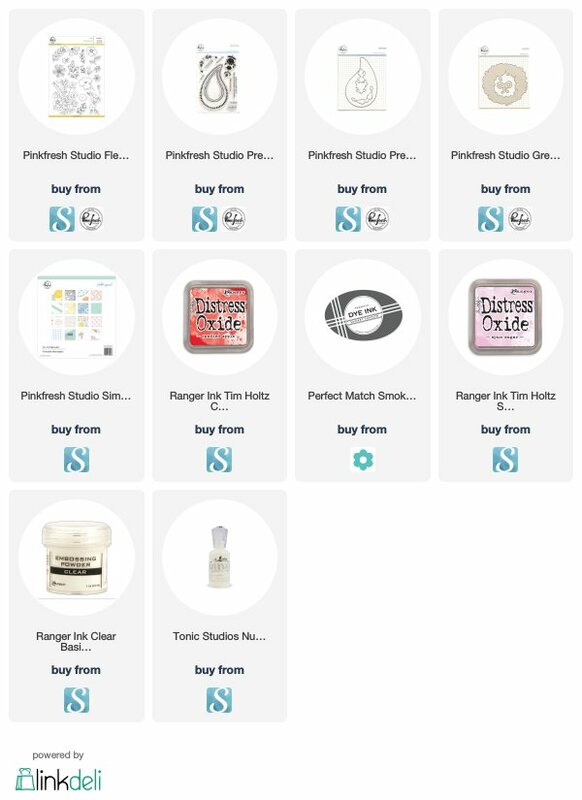 Today officially marks my first day over on the Pinkfresh Blog! Come along and check out what I've made with some of my favoritest goodies. To kick things off, I have a couple of easy and fun Valentine's projects that are perfect for grown ups! First up, is a sweet little DIY that can be personalized, and is super fun to gift to all the tea lovers on your list. 1. To make the tea baggies, start with coffee filter paper. You can use dies, punches or your scissors to cut up a few layers in your favorite shapes (I've used hearts here). 2. Once you have your loose tea choices selected, make mounds that are about 1 tbsp in size. Set aside. 3. Using colored embroidery floss, stitch two filter pieces together, but leave a little opening to funnel in your loose tea. 4. Once you've added the tea, finish the stitching, but leave a little extra string for dipping, looping it around the top. 5. Make dipping tags by folding tiny pieces of cardstock strips. Once folded and glued together over the string, notch each side with your scissors. Add a button, sentiment, or leave plain. 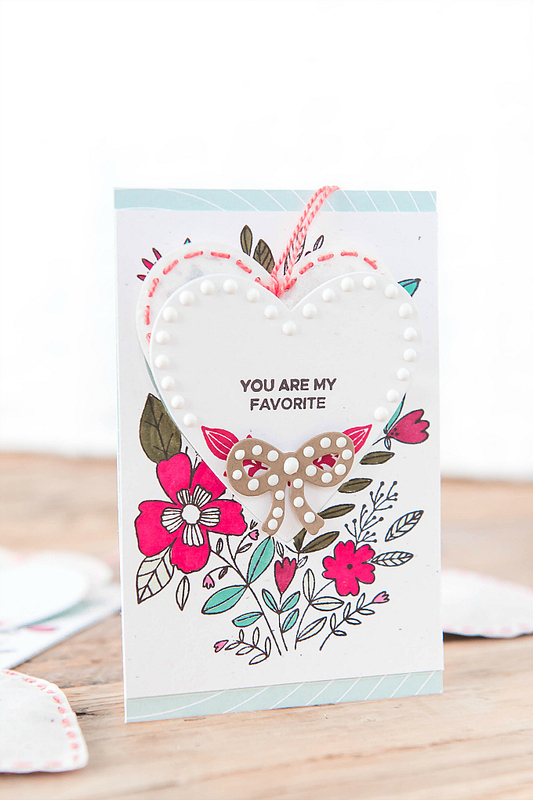 To make the adorable insert cards, I've used some plain white cardstock, and the gorgeous Pinkfresh Fleur 1 stamp set. To make the little flap (for tucking in the tea baggies) simply punch, or cut out the same shape that you end up using for your teabags. Remove the punched piece, and stamp your favorite design. Here, I used the gorgeous florals from Pinkfresh (tip: it helps to use a large background stamp such as this one for quick and easy coverage). 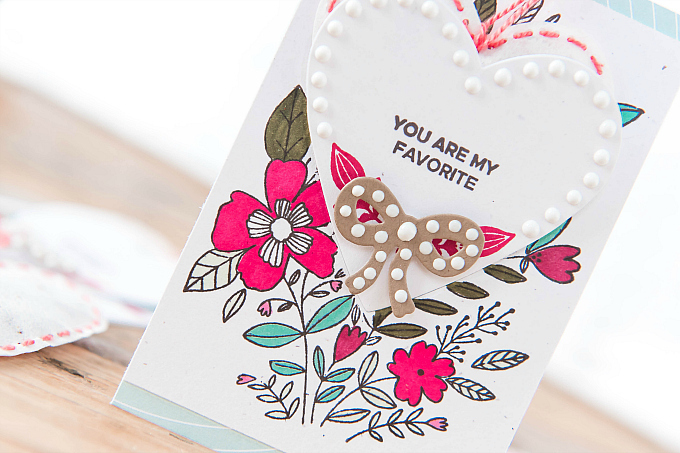 After coloring, I added a sweet sentiment to each heart, using the Pretty Paisley stamp set, and I also added a kraft bow, die cut with the Great Joy dies. After everything was assembled, I simply adhered the lower part of the heart back in its place with a little tape, leaving the top open for tucking. Lastly, I added some Nuvo drops to both the heart and bow, and backed the cards with some light aqua paper from the Simple and Sweet collection. Since the teabags are pretty autonomous and repetitive to make, I love to gather all my supplies on a tray, and keep my hands busy while we're watching our favorite shows. They come together super quickly this way! 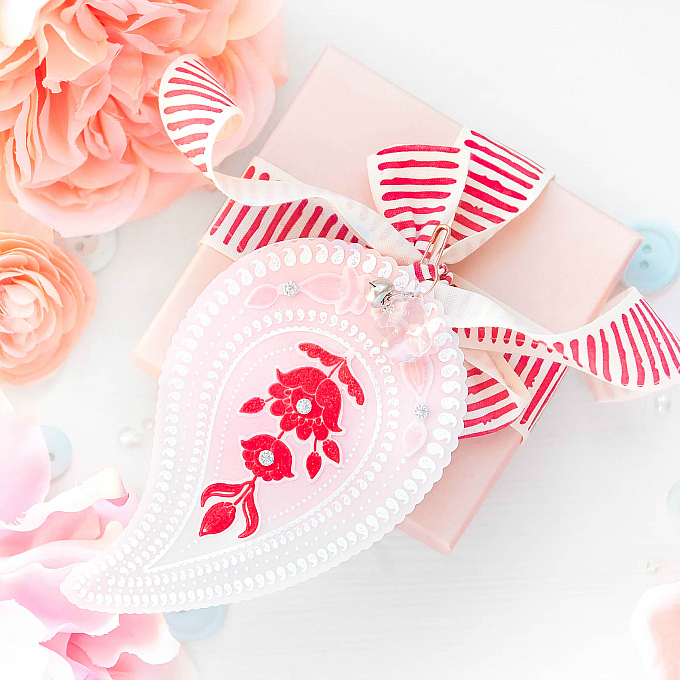 For my next project, I'm sharing another take on Valentines, but this time with a sliding tag that's perfectly sweet for wrapping up gifts. I absolutely adore this gorgeous paisley stamp and die set. It's become one of my favorite go-to's. Combined with vellum, and heat-embossed details, it's even more decadent and sweet! 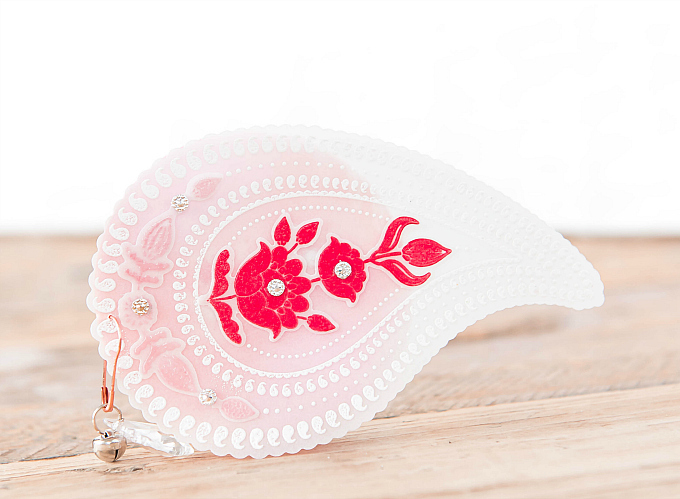 When bundled together, the vellum tag looks lovely and so delicate pinned to a bow. The best part? Sliding it open reveals a sweet message! Here I started with some plain vellum, die-cut in that gorgeous shape. I also die-cut the coordinating wee bits. I then used my Distress Oxide ink to stamp my designs in pink and red, followed by clear embossing powder. I love that this leaves me with a really saturated image, and allows me to have a little more color play because I sure own more inks than embossing colors! I also stamped the outlines in some Versamark ink and added white embossing powder to finish. For the sliding tag, I watercolored a wee bit of cardstock, and then stamped the border and floral accents using the Fleur 1 stamp set. The sentiment is from the Pretty Paisley stamp set. 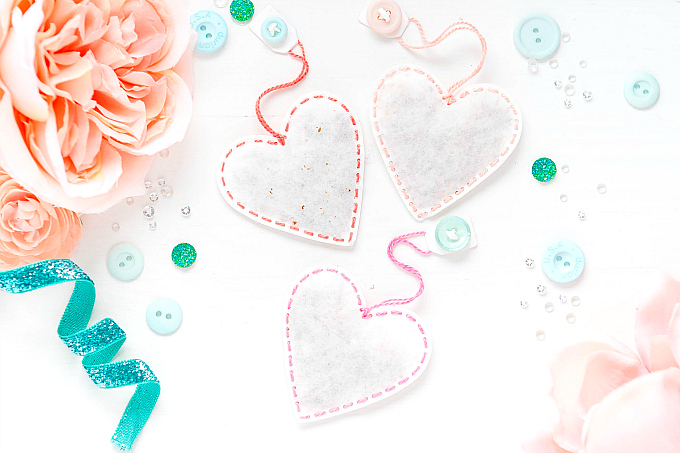 It may not be Tuesday (I know I'm a day early) but I hope you've enjoyed today's post and that these little creations help in your own Valentine's Day crafting! 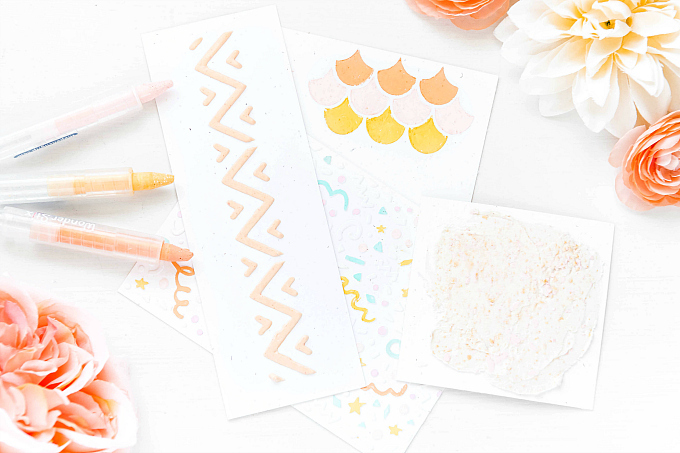 Give these sweet projects a try! I promise, you'll love them! 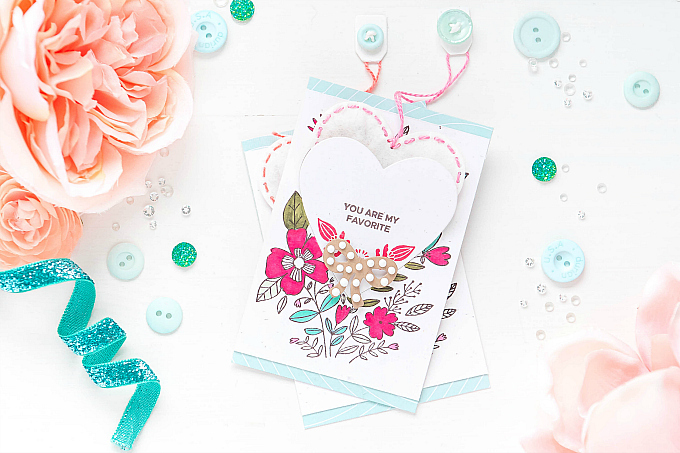 Be sure to share with us using the hashtag below, and don't forget to check out the sweet projects Lena from PinkLionCards has shared with us! 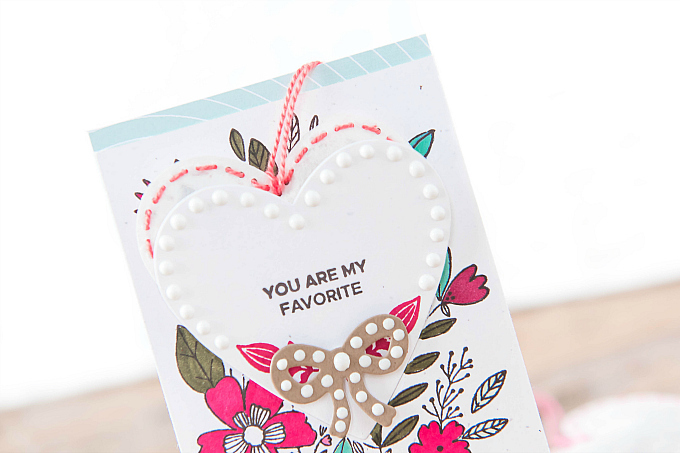 Your tea bag card is such a cute idea! I like the colors and white dots you added. And your sliding tag...oh my goodness...it's stunning! Love the top paisley tag. Everything about this is soft and feminine. Amazing projects Ivana! Thank you so much friend! I’m very much looking forward to this creative adventure! Wow Ivana love the designs what fun ideas. Well. I have not one good excuse for not stopping by when I said I would... life does have a way with the best of intentions, right? I can say honestly that these fabulous creations are always well worth the wait, Ivana! I am totally stealing/will give credit to your tea bag idea, btw. Beyond adorable & so creative, Ivana! You never cease to amaze me with your incredible projects & use of vellum which I love, but seldom seem to use! Awe thank you, Greta! That is so sweet of you to say! 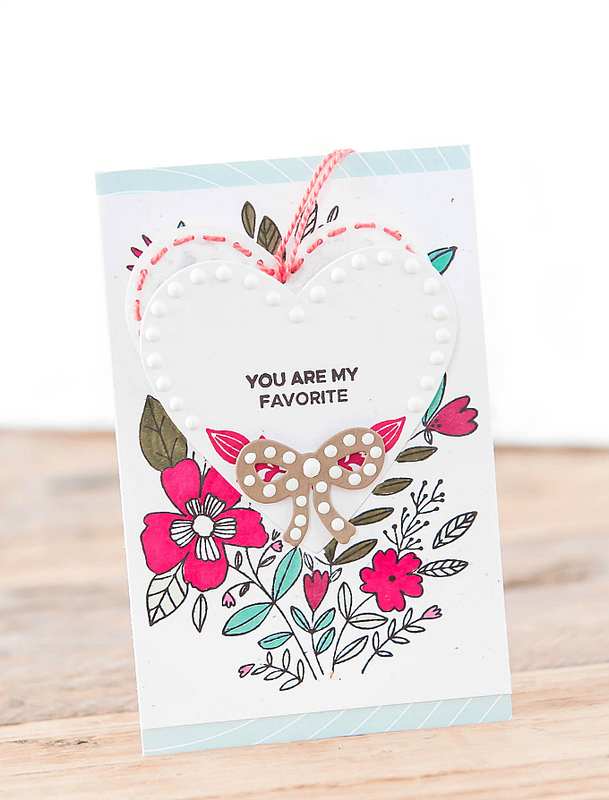 Biggest hugs to you dear friend - hope vellum makes it into your cards soon - it really is lovely, isn't it?